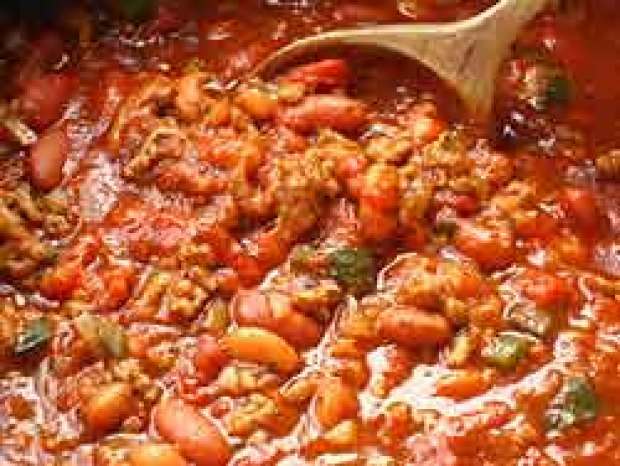 Continuing with my healthy eating recipes for the start of a new year, I've created this hearty vegetable chili with help of my friend Joey Chiappetta. This recipe is loaded with ingredients and works best if you take your time and prepare it in stages as described below. Also, feel free to add or substitute other vegetables if you like. 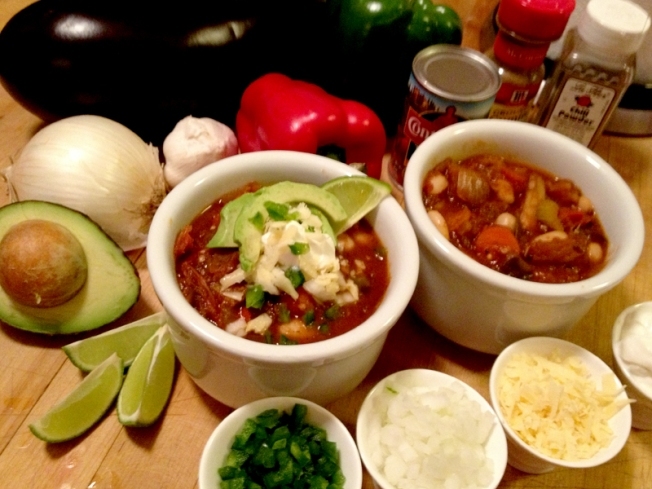 This chili works best by preparing the vegetables in stages. The goal is to caramelize some of the items to add as much flavor as possible to the dish. So, using the same saucepan or skillet, work in stages as described below and then add them to the stockpot. You can also use more than one saucepan to prepare the vegetables more quickly. A big part of the flavor in this chili is the smoked tomatoes. You can use either a smoker or a charcoal grill with the coals to the side. * Preheat your smoker or grill and add a bit of mesquite or hickory wood to generate the smoke. Smoke the tomatoes at about 275 degrees for 30 minutes. Remove and transfer the tomatoes to a large stockpot. Heat a tablespoon of olive oil in large saucepan over medium high heat. Add eggplant and sauté for about 20 minutes until eggplant is browned and caramelized. Transfer to stockpot. Add another tablespoon of olive oil and add mushrooms. Sauté for about 20 minutes as well and then transfer to stockpot. Add another tablespoon of olive oil and add carrots, quash and zucchini. Sauté for about 20 minutes and transfer to stockpot. Add another tablespoon of olive oil and add remaining vegetables (onions, green pepper, red peppers, leeks, celery, jalapeño and garlic). Reduce heat to medium low and sauté vegetables until onions are tender and translucent, about 15 to 20 minutes. Add ground rosemary, oregano and ground cumin to the vegetables and sauté for an additional 3 minutes. Transfer to stockpot. Add tomato paste, Worchestershire sauce, chili powder, salt, pepper and vegetables stock. Bring mixture to a boil, then reduce it to a simmer. Simmer for 45 minutes. Add beans, simmer for an additional 5 minutes. Serve with garnishes of your choice on the side. *If you don't want to use (or have) a smoker or charcoal grill, you can also roast the tomatoes at 400 degrees F in the oven for 30 minutes and add 2 teaspoons of liquid smoke to your chili. Liquid smoke is usually available in the same aisle as ketchup and Worchestershire sauce in your grocery store.